How do I opt out of ClassTag Rewards? If you don't want to take part in the ClassTag Rewards Program - no problem. 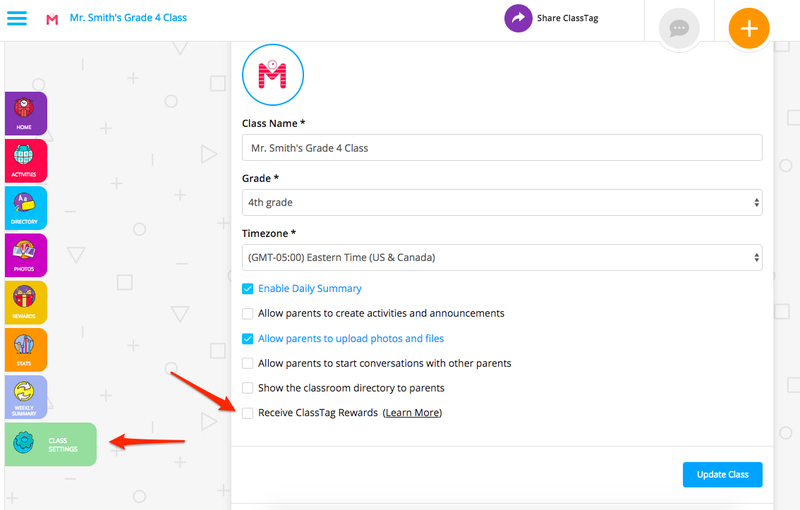 Simply navigate to your Class Settings area and uncheck the box alongside "Receive ClassTag Rewards". What happens when you opt out of ClassTag Rewards? Your classroom will not receive any ClassTag Coins for everyday use of ClassTag (to receive free classroom supplies and gift cards). You and the parents in your classroom will not see any sponsored content. You will still see the Rewards page, but only be able to earn ClassTag Coins (for free classroom supplies and gift cards)) by referring other teachers to ClassTag. Remember, you can change your mind and opt back in to start getting free Rewards at any time! Every parent in your class has an option to opt out of sponsored emails from ClassTag that might be sent from time to time. If they do so, from the moment they opt-out, they will no longer receive sponsored communications. Please note, however, that when parents opt-out, it limits our ability to support the ClassTag Coins your class receives as their activity will not be counted. How and when do I earn free ClassTag Rewards?